A study by Franklin Covey the authors of the four disciplines of execution http://www.4dxbook.com/#/videos/overview/ revealed that most businesses fail to achieve their strategic objectives because they simply have too many. The study showed that once companies spread their focus on three or more “BHAGS”, “Wildly Important Goals” or “Mission Critical Strategies”, [insert preferred buzzword here] their rate of success dropped close to zero. So, despite the fact that this is common knowledge, why do companies continue to struggle to find focus when it comes to implementing their strategy? 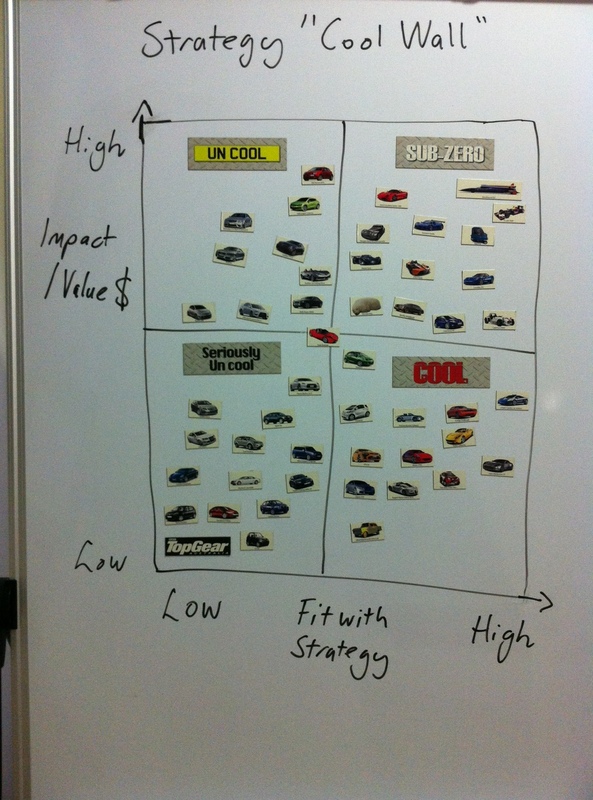 As an avid Top Gear fan I believe that if Executives and Managers took a leaf out of Jeremy Clarkson’s “Cool Wall” book, companies would make a huge impact on their ability to implement strategy. 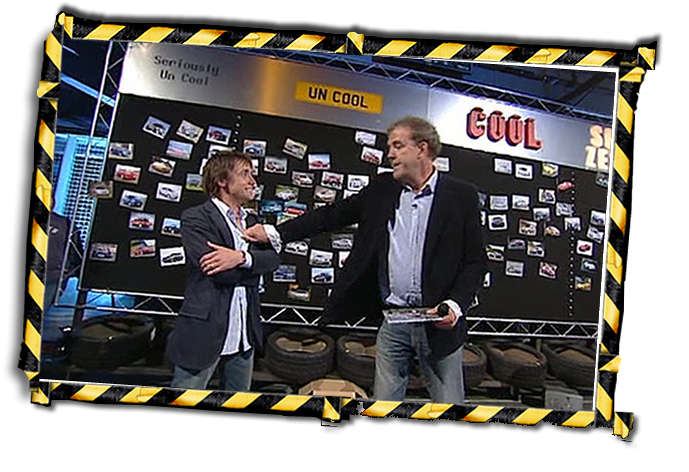 The image below shows Jeremy and co-presenter Richard Hammond “discussing” (do you recognise the body language?) where this weeks car should be placed on the wall. I’ve been in my fair share of strategic planning sessions over the years and the trouble is that most of them end up looking like the one in Figure 2 below. Which if you look carefully has twelve initiatives in the “Sub Zero” zone, far too many. How many will get implemented successfully? Probably zero, at best one or two. However if we follow the Top Gear approach and adopt these three straightforward steps, we can make a massive impact on our chances of success. The Top Gear rules are pretty straightforward. This one is based on Jeremy’s crush on the actress Kristin Scott Thomas. To be classified as “Cool” or “Sub-Zero” Kristin would have to hold the driver of the car in high regard. Ok, these might seem a bit light hearted for something a serious as strategy, but how often have you sat through a planning session where a “good” idea made into the plan because of the Halo effect of a dominant executive. A clear set of rules and criteria agreed in advance reduces the risk of mediocre and even good ideas making the cut. Top Gear does this religiously every episode, and they don’t shy away from moving cars around on the wall if things have changed. Your competitive and strategic environment changes at least a frequently as a premiership football player changes his car? Make sure you review your “Cool Wall” at least once a quarter, and don’t shy away from cancelling projects if they no longer meet your criteria. This is probably the hardest of the three rules to achieve. Unless you are using an external facilitator (and even then if they are relying on being invited back they may not be to keen on explaining why the CEO’s pet project hasn’t made it in the “Sub Zero” category), ultimately it will down to your Board and Leadership team to set the tone from the top. If they are seen to ignore the rules, then don’t expect senior and middle management to follow suit. However if you can instil the discipline to follow these three simple steps then maybe your strategy will finally stop spinning its wheels and start to get some traction. Really “Sub-Zero” work here! Its my turn at the office to share a new idea, and I am taking this one and printing this article as the handout, great job!!!! Elaine glad you enjoyed the article – good luck in your session today. Let me know how you get on? Love it! Not only is this a spot-on article but the next time I get nagged for watching too much Top Gear I’ve got the perfect excuse.